The induction starts at 5:00 pm. All inductees are asked to please be at the Fine Arts Theater Lobby by 4:30 for lineup. 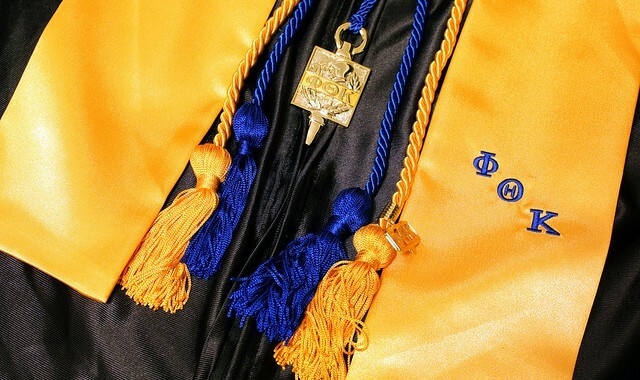 If you have not yet completed your application for Phi Theta Kappa membership, and received confirmation of payment for your membership fee, please complete before registering for induction. In addition, please consider nominating a staff or faculty member for the Golden Apple Award. This can all be done at registration! Dates for the upcoming College Project-Club Week- are to be determined by the end of the week. There is going to be a Skype meeting with the Regional team, Tuesday, September 16th, at 3:30 in CC117. Vicky and Richard are offering extra credit to their students for completing a summary that reflects our Honors in Action topic. This will increase our number of summaries to choose from when we write our Hallmarks. Another way that it has been decided to get more members is to just talk to people in the classes that you are taking! There is also discussion on making a YouTube video that will “promote”/”inform” people about PTK and why they should join! Debra will be updating the website with current information and anything fun and exciting! Christy will be doing the advertisement for getting people to help write some summaries! Students from Rosemount are coming to IHCC to gain more information/benefits of a two year college. There will be a PTK table. If you anyone wants to help out, don’t hesitate! Skype Meeting with Regional Team at ~3:30 p.m.
We talked about many different topics/events that will be happening in the near future! Going to the Devil’s Lake Conference is up in the air. Prepared and straighten out any issues for the Fall Conference coming up. We went over the food, who is going to be presenting and when, and finalized any other lose ends! The Region is looking to put up an alumni table up. If you have any ideas, throw them out there! They are also prepping for a Regional slideshow that would play at Conferences, possibly while people register etc. An idea that was thought of was doing what is called “100 ideas in 100 seconds”. This would showcase ideas from other chapter on how they have been successful, which could help those chapters struggling. Since there is no continental breakfast at the hotel for the Fall Conference, we will be providing a breakfast on Saturday morning. We looked at ordering assorted fruit bowls, assorted muffins, and getting some whole fruit like apples and bananas. It was decided that the haunted house is going to be a fellowship activity. This will take place on October 3rd from 7 p.m. to 10 p.m. More details/specifics to follow! A letter was sent to Tim Wynes and Christina Royal about attending the Fall Conference. There will also be another meeting with Tim Wynes about the College Project. The specific dates on when Club Week is going to be happening are in the works. We are looking at the week before Thanksgiving! We are hoping to have a slideshow playing during Induction, and also the video concerning Richard and PTK. We need to find some more people to help out with this event! If you know anyone, let us know! We could use them! Vicky handed out articles to all the officers at the meeting. These articles will help us keep the ball rolling on our research for our Honors in Action Project! We discussed new ways that we can get people to come to the meetings! Tabling, talking to people in our classes, writing something on Facebook etc. Nicolette will be doing a session on SSD in the evening, and Christy will be covering the morning session. The topics of these sessions are still being discussed! SSD is on Tuesday, September 23rd. Don’t forget!